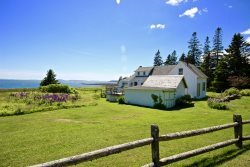 A masterpiece on the coast of Maine- Classic beachfront cottage. Etta's Cottage was built in the 1960s by Etta and Almond Hall on land that had been owned by their family for 200 years. The cottage, which is a everything a summer cottage along the shores of the St. George River, a tidal, saltwater riverway, should be...and shouldn't be. Although the cottage was moved from its original spot in the early 2000s, the porch still offers views of the water and the cottage, as explained by one of its guests, "...makes you feel like you are a million miles from everything that isn't as important as salt breezes, peace and quiet." Exposed beams, a fireplace dominating the living space, vintage bead board cabinets create just the kind of getaway you are craving for. Modern amenities like a flat screen television with a DVD player, WiFi and a full sized kitchen make time there easy. Inside the house there are two bedrooms partitioned with 3/4 walls - one with a double bed and one with a twin trundle bed. The bathroom has a full sized tub and shower. The living room has plenty of comfortable seating, centered around the fireplace. The kitchen is fully equipped for basic cooking needs and the kitchen table can seat 4-5 comfortably. Large picture windows let in lots of natural light and cooling breezes - if there ever is a sudden chill, the cottage also has heat. The deck is large and spreads across the entire front of Etta's Cottage - there is a bistro set for eating outside as well as a lounge chair and three Adirondack chairs. A gas grill is also provided. Located in the Wiley's Corner area of St. George, the cottage is just a 10 minute drive to Tenants Harbor and 10 minutes to Rockland. Dogs are considered at this property. Bedding and bath towels are provided..
Fire Place: small fire in fireplace ok.
WIFI NOTE: SummerMaine recognizes that access to the internet is as important as electricity and running water to most, if not all, people. However, Maine is a more rural state by nature and infrastructure. Accessibility is limited, often unpredictable and unreliable depending on location. While some properties do have internet connection that is more “modern”, many properties are in locations that only allow for DSL or satellite connection which can be slower and at the mercy of weather, whole network connectivity and the like. Please be aware SummerMaine cannot guarantee the speed or accessibility of the internet at any of our properties during your stay. Outages of any type are not the basis for a refund. We cannot guarantee repair times or repair person availability. With that said, if you have certain needs regarding the internet, please let us know and we will indicate the properties providing the service that best meets your needs. Dogs may be considered with owner approval, non-refundable fee and pet policy agreement. Please inquire. No boats, kayaks or other watercraft are provided due to insurance restrictions. Please contact Port Clyde Kayaks for rental options. Limited Household Consumables and items: The following items are typically found at the properties to get you started. - Bathroom tissue/toilet paper 2 rolls per bathroom per guest turnover. - Propane or Charcoal for Grill. Grill tools- scraper/steel brush, spatula, tongs, fork. Oven Mitt. - New Kitchen sponge per guest turnover. -Some properties will have dry spices and other items. We are not able to inventory these things…if you will want to have something special to cook with we suggest bringing it with you. -Additional paper towels, toilet paper, paper/plastic ware etc. -Shampoos, body soaps and other personal hygiene products. -Beach gear- beach towels, chairs, sunscreen, bug spray, etc. Clothing: The weather can change dramatically from one day to the next. You will want to dress for the season. It is best to be prepared. Even in the warmest days of summer the nights can get cool. In the fall it is always a good idea to have a sweatshirt or jacket with you. A Processing Fee of 9% of the rental amount. *A NON-REFUNDABLE DEPOSIT OF 1/2 OF THE RENTAL AMOUNT IS DUE UPON RESERVATION. Cleaning requirements before check out: Please leave all used towels in the tub. Please remove all items from the refrigerator and wash dishes. All furniture and furnishing MUST be returned to the original location they were in upon check in. Please bag all trash and leave in receptacle provided. Check in and out times: Check in is 4:00 PM and Check out is 10:00 AM. Early check in/out is not allowed in the high season. Guests who have not vacated by 10:00 AM will be charged $25.00 every 15 minutes after 10:00 AM.